Dominion Dealer Solutions announced today that its industry-leading automotive equity mining solution, DealActivator, is now fully integrated with Dominion Autobase, one of its customer relationship management (CRM) systems. The combined power of Dominion’s DealActivator and Autobase platforms gives franchised auto dealerships enhanced business intelligence and new lead information to increase sales. We are excited to bring DealActivator's award-winning equity experience to Dominion's Autobase CRM. Automotive dealers using Dominion’s Autobase will be ecstatic to start experiencing smart priority leads and other equity enhancements directly in the CRM. “Dealers need efficient ways to follow up all leads. With the new Autobase Equity Logbook, both new and used car dealerships can contact their equity leads through the same processes already in place for lead follow-up in the CRM. This makes it a seamless process and ensures that no opportunity falls through the cracks,” noted John Hardacre, product manager for Dominion Autobase. This integration gives new and used car dealership sales managers easy, instant access to a vehicle’s DealActivator equity data within Autobase CRM. Now, Autobase CRM users will experience the largest driving force in equity sales -- the DealActivator Priority Page. 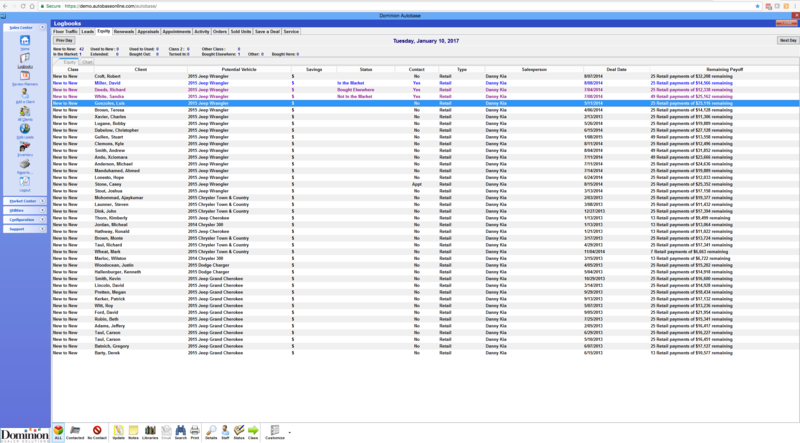 For dealers using both DealActivator and Autobase, the CRM and equity information will appear on the same screen. Automotive dealers will no longer be required to log into these systems separately, saving time for both dealership employees and customers on the lot. 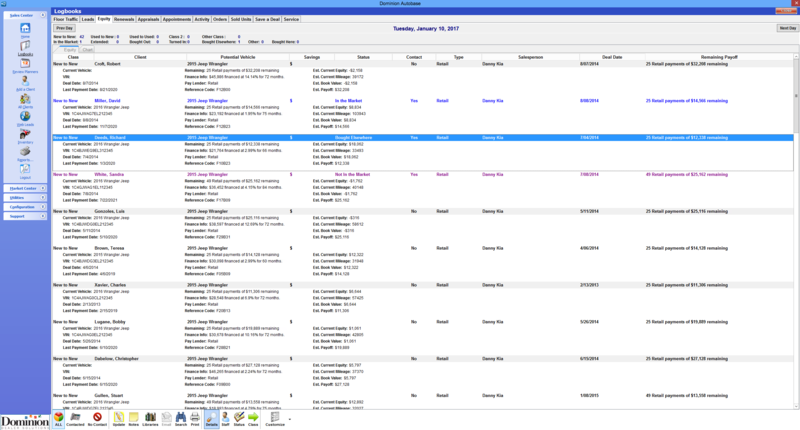 Dealers can quickly review top equity service customers daily without leaving Autobase CRM. Customer updates, including calls, emails, texts or notes made in either system, will be reflected in both, eliminating the need for additional manual entry. Dealers using Autobase CRM will find the follow-up process streamlined by this integration, since they can now contact customers in an equity position in priority order by filtering those most likely to close. “We are excited to bring DealActivator's award-winning equity experience to Dominion's Autobase CRM. Automotive dealers using Dominion’s Autobase will be ecstatic to start experiencing smart priority leads and other equity enhancements directly in the CRM,” noted Alan Andreu, general manager of equity solutions at Dominion Dealer Solutions. For more information on the benefits of DealActivator’s equity mining tools combined with Autobase’s CRM at your automotive dealership, please call 877-421-1040.